What an amazing plant science moment occurred in the Semitropical Greenhouse this morning, as a fascinated crowd gathered to see what was happening with Spike, the titan arum. On Saturday, it was determined that Spike had run out of the energy it needed to continue its bloom cycle. Spike is powered by energy from the sun, stored in its beach-ball-sized corm—a tuber-like underground structure. 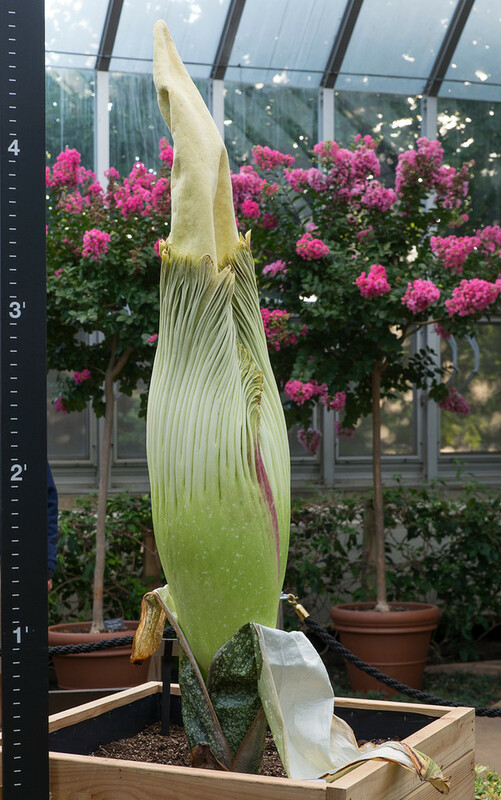 A tremendous amount of energy goes into producing the single, giant flower structure that a titan can send up in its first decade or so of life (Spike is about 12 years old). 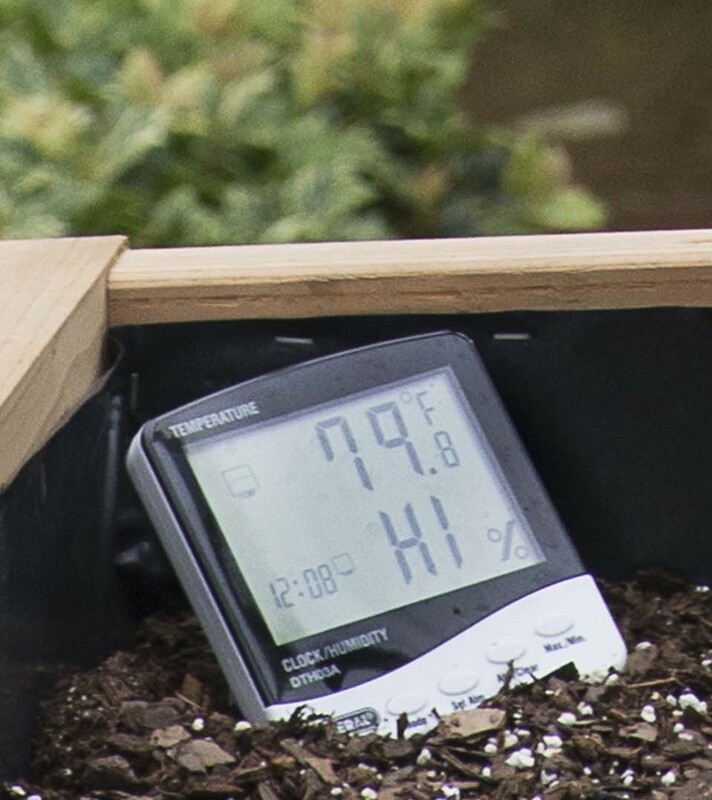 As this week’s expected bloom time passed, our science and horticultural staff went into action. 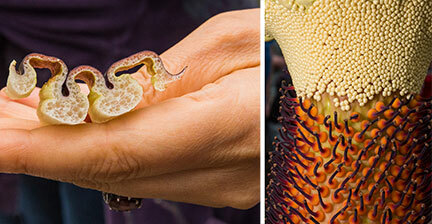 Spike wasn’t dying—but the flower structure had stopped maturing, and the spathe did not open. On Friday, Dr. Shannon Still, conservation scientist, and Tim Pollak, the floriculturist who had raised Spike from a seed, peeked inside the frilly spathe to check for pollen. “If there had been pollen, it would have been all over my hand,” Still said. Pollen’s absence meant that the male and female flowers might not be fully developed. The possibility remained that pollen might still develop, even though the spathe would not open—and THAT led to the decision to remove the “frozen” spathe to see what was happening with the real flowers inside. First, Still assembled a working kit: scalpel, probes, test tubes, paintbrushes and a “scoopula” (to collect pollen). At 10 a.m. today, staff gathered for the delicate procedure. Pollak and Still fist bumped…and the operation began. As Still began cutting just above the peduncle (stalk), the crowd grew quiet. Dr. Pat Herendeen, senior director, Systematics and Evolutionary Biology, narrated for the crowd. As the spathe started to come away from the towering spadix, the internal color started to be visible. Left: A cross-section of the spathe reveals the cell structure inside. Right: A close-up of the hundreds of male (top) and female (bottom) flowers inside Spike’s spathe. Pollak held the spathe steady as Still continued to free it from the stalk. With one last cut, it came free—and the crowd gasped as the inside of the spathe was unfurled and the true flowers at the base of the spadix were revealed—pale rows of bumpy-looking male flowers atop a strip of orange and brown female flowers. Left: Tim Pollak and Shannon Still make the first cut. Right: Tim Pollak reveals the spathe’s ravishing color. Herendeen answered as questions flew: The male flowers do not appear to have produced pollen yet. Spike’s fabled scent is only detectable very close up to the spathe—much less apparent than it was earlier in the week. Cameras focused in on the flower structure, as Still and Pollak carried the two large pieces of the cut-away spathe over to the crowd. Hands reached out for a touch; noses leaned in for a sniff. 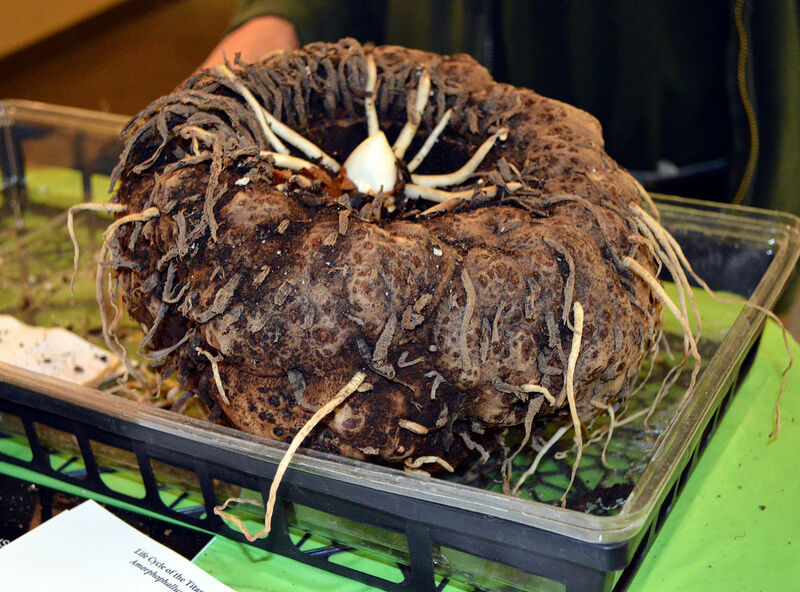 Spike’s spathe was set out on a gallery table so that everyone could touch and admire it before it begins to wilt. Cross-legged on the floor opposite Spike sat Chicago artist Heeyoung Kim, who sketched intently during the entire process. Her intricate pencil markings captured Spike’s pleats and tightly clustered flowers—the beginnings of a botanical illustration that could inform future scientists studying the titan arum’s beautiful structure for years to come. We have been so thrilled with the intensity of interest in Spike—it’s not every day that crowds gather to watch a plant grow! We’ll continue to keep you posted about possible pollen development, our scientists’ thoughts about Spike’s arrested development, and on the progress of the eight other titan arums now growing in our production greenhouses. Left: What a great vibe from the gathered crowd! Right: Kris Jarantoski, executive vice president and director, explains Spike’s spathe to a young visitor. For more information please visit our titan arum page. Can Spike’s “Perfume” Be Captured in a Jar? Of the many Spike-related questions asked by visitors this week, our favorite came from 8-year-old Prairie! In the video below, Prairie wants to know, in essence, if she can transport Spike’s malodorous odor from the Chicago Botanic Garden to her classroom. Conservation scientist Dr. Shannon Still has a fascinating response. Dr. Still will attempt to pollinate Spike’s flowers during bloom with pollen shared by our friends from The Huntington Library, Art Collections, and Botanical Gardens, and Denver Botanic Gardens. Prairie, your experiment with scent would make a great science project! If you come to the Garden on the night Spike blooms, perhaps you’ll get to see Shannon Still working on “Operation Pollination.” Introduce yourself if you’re there! Watch Prairie’s question on YouTube. Watch Shannon’s response on YouTube. Posted on August 28, 2015 March 10, 2016 Author Karen Z.Categories Behind the ScenesTags #CBGSpike, amorphophallus titanum, corpse flower, fragrance, odor, scent, titan arum3 Comments on Can Spike’s “Perfume” Be Captured in a Jar? 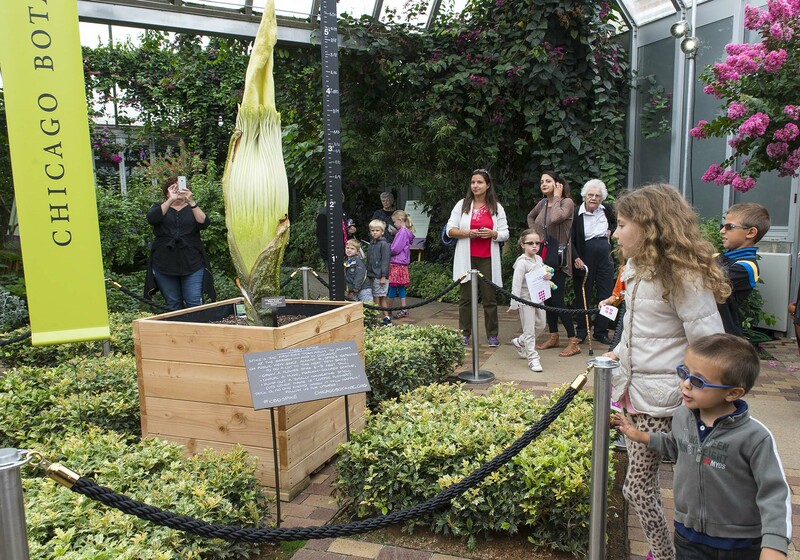 “Where does a titan arum come from?” That’s a question we heard a lot from Spike’s visitors this past weekend. 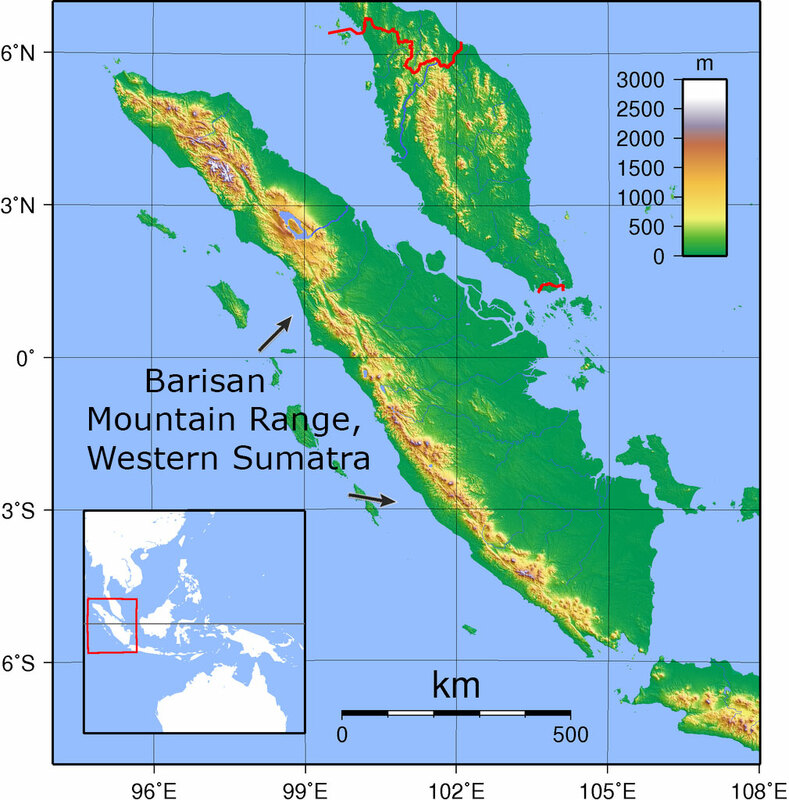 Titan arum occurs throughout the Barisan mountain range in West Sumatra, Indonesia. The titan arum, native to the rainforests of the island of Sumatra in Indonesia, was first “discovered” by Italian botanist Odoardo Beccari in 1878. On August 6, 1878, he first observed the leaves and fruits of a plant (interestingly, August 6 is the date we put Spike on public view!). Several weeks later, Beccari saw a flowering plant for the first time. He sent a few tubers and seeds to Florence, Italy, but the tubers all perished; a few seeds, however, eventually germinated. One of those seedlings was sent to the Royal Botanic Gardens, Kew, in England. There, in 1889, 11 years after its discovery, a titan arum plant flowered for the first time outside its tropical home. No one knows how common the titan arum is in the wild. Many suspect it is endangered. Its only known habitat is the rainforest of Sumatra, which is being steadily eroded by deforestation for palm oil production, by pollution, and by human encroachment. The corms are also being dug up for food—and by collectors or poachers. Also contributing to their demise is the fact that many species in the genus Amorphophallus, including the titan arum, are highly endemic. 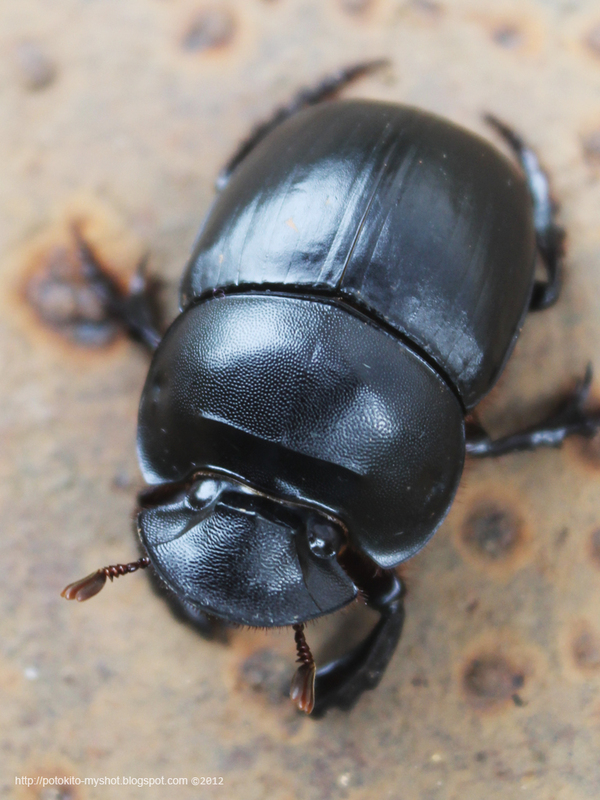 This means that they are only found in relatively small, restricted geographical areas. If the rainforest home of these species is destroyed, we will continue to see their numbers decrease. 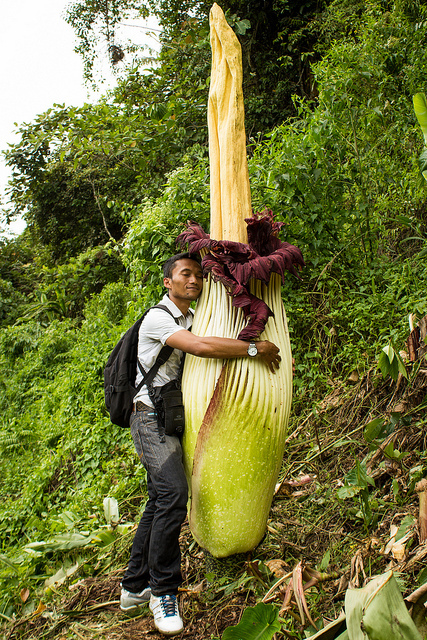 What can we do to help conserve the titan arum and similar plants? 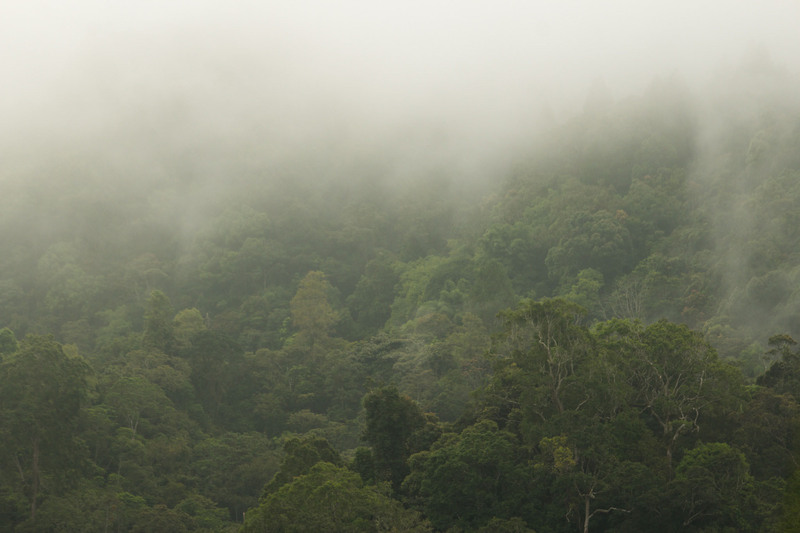 Start by learning more about tropical rainforests, and the impact of deforestation in these areas. Support your local botanic gardens, arboreta, and universities where scientists are studying endangered plant species and promoting the importance of plant conservation. The titan arum (Amorphophallus titanum) is one of the plant kingdom’s most spectacular phenomena—and spectacular plants help us all to realize the incredible complexity and diversity of the natural world. Become a Garden member and support the world’s spectacular plants, like Spike, at the Chicago Botanic Garden: We cultivate the power of plants to sustain and enrich life. We are getting closer to bloom time! Check our website, and #CBGSpike on social media to stay on top of bloom updates!